Get Grapple Boom Truck Financing with First Capital! Have you rented grapple boom trucks in the past and want to know if you can buy? Do you have questions about grapple boom truck financing and wonder whether your credit is an issue? If you have these questions and more, don’t worry. First Capital Business Finance is here to help. Why Finance a Grapple Boom Truck? One question you no doubt have is why finance? If renting grapple boom trucks has worked for you in the past, financing one might seem unnecessary. This is especially true if you only use them with certain projects a few times a year. However, with a little innovative thinking, grapple boom trucks could become the workhorse you need in your stable of equipment. Take a look at these situations below to see how grapple boom truck financing could open your business up to new markets. Grapple boom trucks were so efficient that even though the cleanup crew already owned nearly 100 trucks, they rented an additional 14 more to complete the job. When Hurricane Harvey dumped an estimated 19 trillion gallons of water over Houston, many homes were flooded beyond repair. 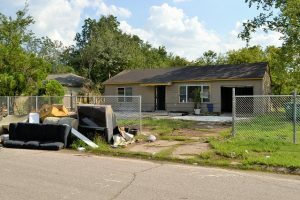 Piles of trashed furniture, valuables, and even physical pieces of homes, like walls and siding, were laid out on Houston lawns. Thankfully, Grapple Boom Trucks were the perfect cleanup tool. They could move quickly between cleanup sites without further damaging the area and could delicately pick up the debris to dump on their truck beds. The grapple boom trucks were so efficient that even though the cleanup crew already owned nearly 100 trucks, they rented an additional 14 more to complete the job. Are You Interested in Grapple Boom Truck Financing? Grapple trucks can load on remodeling waste for easy disposal. Have you ever thought about getting into the home remodeling industry? Do you have projects coming up that need to be completely gutted? Like with Hurricane Harvey, grapple boom trucks can load on remodeling waste for easy disposal and make your job easier and more efficient. Some companies have even used them to deliver and collect Port-A-Johns to their worksites to ensure everyone can work comfortably. Now your business is growing more than you could have imagined all because of grapple boom truck financing. recycling for most of the town. That’s where grapple boom truck financing comes in. With the right grapple boom truck, you could easily collect many extra bulk items such as old fridges, stoves, and couches for a small fee. You could even offer to collect yard waste like cut tree limbs, bags of grass, and weeds, earning you more profits than ever before! Most financial companies won’t work with poor credit. First Capital can! Can I Finance With First Capital? Alright, you’ve weighed all the options and now you’d like to buy. You might even have a grapple boom truck in mind. Most financial companies won’t work with poor credit. First Capital can. We help businesses with bad or no credit, and we will tailor the financing program to fit your needs. We have assist-based financing for start-ups and those who’ve gone through bankruptcy, and corporate-based programs for business who’ve been around for five years. How long you’ve been in business does not matter! Plus, grapple boom truck financing can help you build your credit! By making steady payments each month, you are not only building up credit, you are also opening up your chances to get loans to expand your business. Get Grapple Boom Financing Today with First Capital Business Finance! First Capital Business Finance is committed to helping you meet your cash flow needs to grow your business. We serve small and middle market businesses and large corporations with a range of financing options that suit you. Click below or call (888)-615-7623 to see how we can help you!